These flavor-packed paleo mashed potato waffles are the perfect make-ahead breakfast! I know I’m on the Whole30 when buying 10 pounds of potatoes is an item on my grocery list. Over the past week of my journey, I’ve developed a deeper bond with potatoes. Well, it’s no secret that I love them. It’s just that we’ve become best friends. Seriously. We get together 3 times a day: for breakfast, lunch, and dinner. I wouldn’t have it any other way. Potatoes have kept me sane, kept me from unleashing hangry Lisa last week, and helped me carbo-load before the Spartan Sprint last Saturday. Should I delay my start day until after the race? Screw it, I’m sticking to my plan. But what if I get so exhausted that I can’t make it through the obstacles? Nope, sticking to my guns. I’m going to Colorado in August and I want to drink beer. I don’t want to die though. But . . . beer. It was a bit like Sophie’s Choice. In the end, I stuck to starting last Tuesday, and I made an effort to eat more starchy foods like bananas and potatoes the few days right before the race. To be honest, it doesn’t take too much convincing to get me to eat more potatoes. These waffled mashed potatoes and scrambled eggs were my breakfast Saturday morning and they hit the spot! Together with a small handful of almonds right before the race, I didn’t feel hungry at all! And . . . I can’t believe I finished it! I was bracing for torture Saturday morning and was surprised that I was in better shape than I thought. Now, the obstacle course wasn’t exactly easy. I still can’t climb a rope, and I definitely needed a team member to give me a boost to scale over those 6-feet and 8-feet walls. But I did it, and that’s another item check off of my bucket list. Saturday night, I even went looked up other races or half-marathons in the Bay Area. Clearly, the muscle fatigue hadn’t fully set in yet. But enough about my weekend. Let’s make waffles. To start, you’re going to need some mashed potatoes. I always have a batch sitting in my fridge now. The mashed potatoes are going to get a bit of protein boost from the eggs and almond flour. Then, le vegetables. You’re going to want to cook these for a little while longer than regular waffles (about 4 minutes). You want the mashed potatoes to crisp up and brown so that they’re easily pliable from your waffle maker. 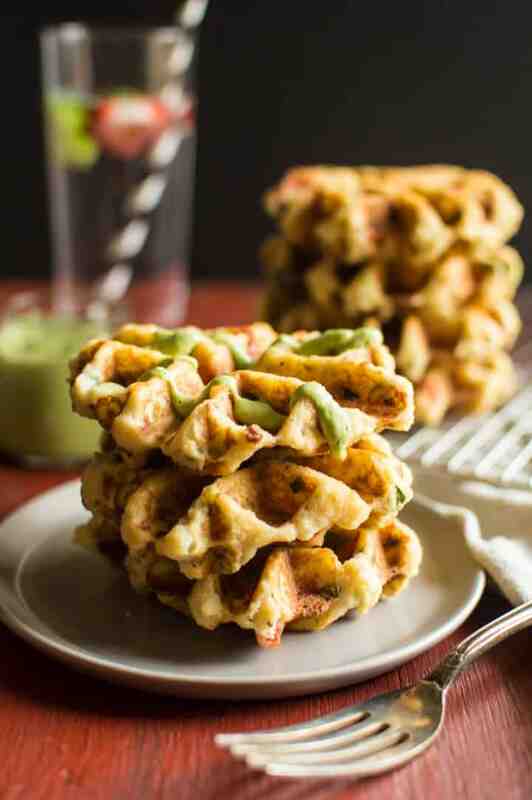 These waffles taste great with the avocado and basil sauce. I’ve also fried up some chicken thighs so that I could eat them à la chicken and waffles style. SO GOOD. What do you do with a massive batch of leftover mashed potatoes? You make waffles! These flavor-packed mashed potato waffles are the perfect make-ahead breakfast! In a large bowl, mix the mashed potatoes, ghee, salt, and granulated garlic together. 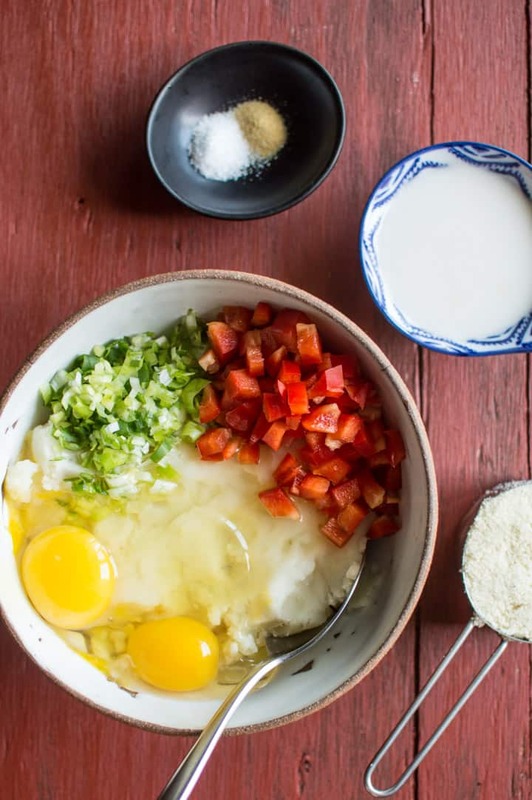 Mix in the eggs, coconut milk, almond flour, green onion, red pepper, sun-dried tomatoes, and basil together. You should get a slightly thick and creamy batter. Brush some coconut oil onto the waffle iron. These waffles are going to be pretty small, so you’ll only need to brush about a 2 to 3-inch square space. Make sure to brush both sides of the iron. Take 1/3 cup of the batter, and place it onto the oiled waffle iron. Close and cook for about 4 minutes. The waffles should have a deep golden brown color. Use tongs or a large spoon to help remove the waffles. 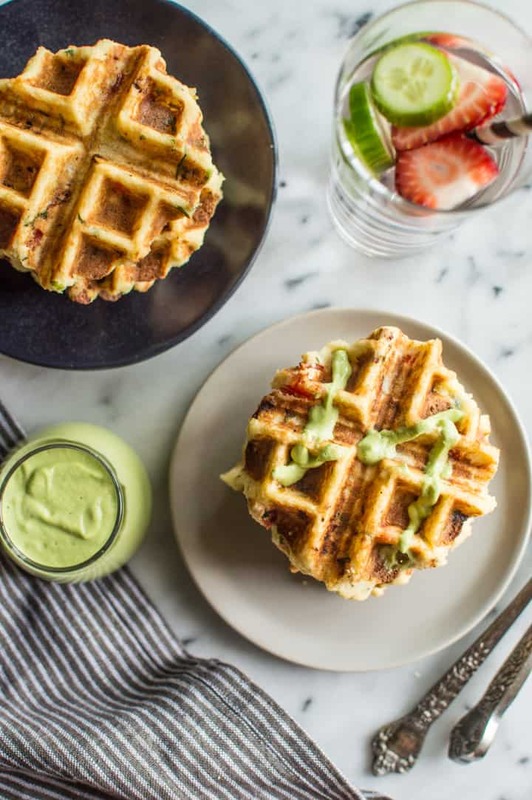 While the waffles are cooking, mix all the ingredients for the creamy avocado basil sauce together in a blender. Serve waffles with avocado sauce. Refrigerate leftovers in an airtight container for up to 4 days. Avocado basil sauce can keep in the fridge for up to a week. It’s great on salads, too! Waffle recipe loosely adapted from the Mashed Potato, Cheddar and Chives Waffles recipe from Joy the Baker. You want to cook these waffles for longer than you would normal ones because this allows the mashed potatoes to firm up and be easier to remove from the waffle maker. NOTE: This post contains affiliate links. Thanks for supporting the blog! These waffles look incredible! I love the avocado basil sauce as a change for maple syrup too! Thanks, Lucie! I’ve been using that avocado basil sauce as a salad dressing too, and it’s fantastic! Mashed potato waffles? That’s genius! I can’t believe I’ve never tried that. Congratulations on the race! Great job! Ohh, hash brown waffles! Haven’t tried that one yet! Hahaha, YES! I’ll need to send some over to you! What a fabulous idea and why not? I like potato pancakes so it was only a matter of time before I came across potato waffles. Love the avocado basil sauce. Thanks! Thank you, Melissa! Also, potato pancakes are awesome! Hahah, I haven’t seed the work Mylanta since the 90s when they always had those commercials on TV! And YES, let me know if you do the Whole30! I will be your (and your mom’s) biggest cheerleader! 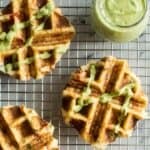 What a clever idea for a savory waffle – love the recipe and the avocado basil sauce on top – so pretty! 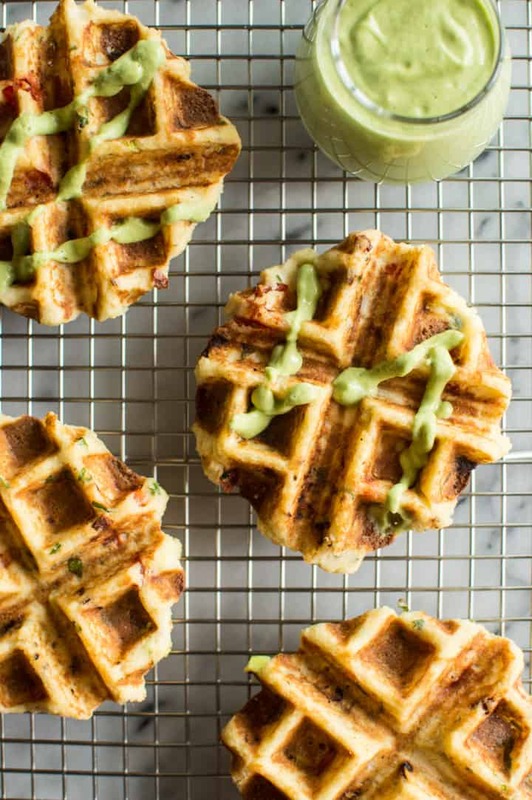 I love the idea of savory waffles! What a great use of leftover mashed potatoes! Pinning to make. Haha, it was soo much fun though. And you know what’s more crazy? I just signed up for another (longer) one! I’m still on my post-race high right now. Gosh, I NEED to get a waffle maker!!! Waffle makers are amazing—you definitely should get one! Ooh, these sound great! I don’t ever waffle anything (besides, uh, plain old waffles) but now I think I need to give it a try. Crispy crunch around melting mashed potato middle? YES. Mashed potato waffles are so fun, Eileen. Definitely need to give it a try! These waffles are sooo ingeneous! plus they look wonderful! Pinning to make this weekend! Thank you so much, Felicia! Let me know if you do! I’m so glad you are doing well with Whole30! 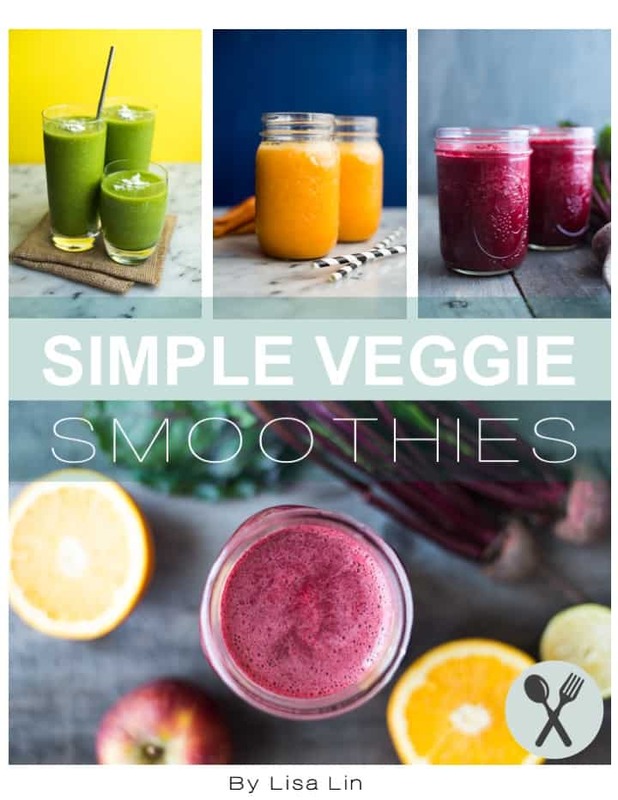 I love seeing the recipes you are sharing for it. These waffles are incredibly tempting!! 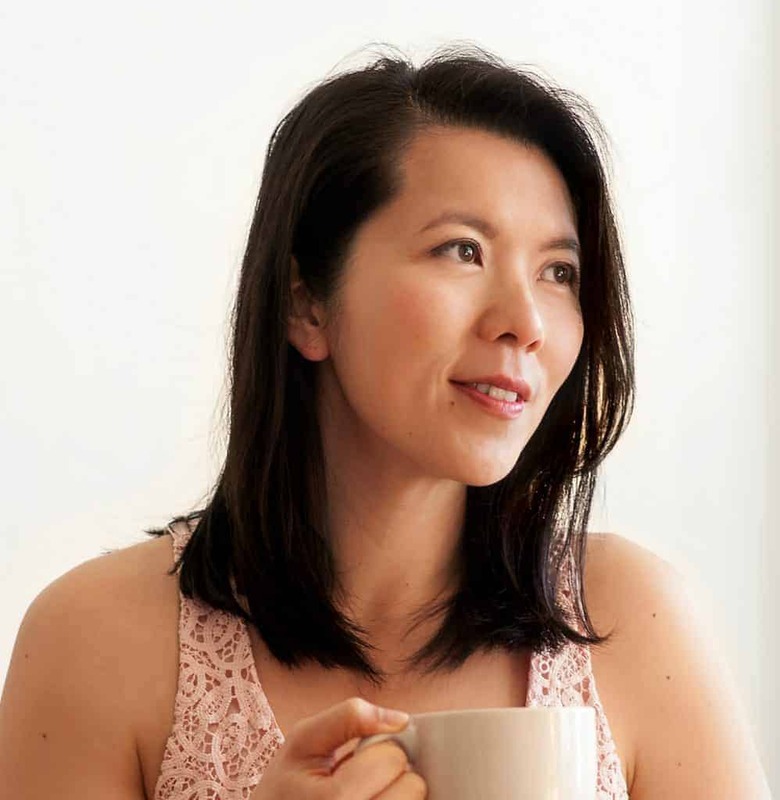 This Whole30 thing requires a TON of planning, but overall, it really hasn’t been that bad! Thanks, girl! Oh my goodness these sound amazing! What an awesome idea!! I love the creamy avocado basil sauce too. I could drink it! Um whoa. Who needs wheat flour when you have these amazing mashed potato waffles?! Gorgeous, Lisa! Totally digging the avocado basil sauce, too! Another great one for me to pin! These look delicious– and thanks for giving me a breakfast option other than eggs. As much as I love them… every day they do get old! Haha, I know how you feel! I’ve had scrambled eggs for 3 days in a row now, and I’m ready for a change!!! Need to get my thinking cap on now. Oh my gosh, Traci, and you send me some of those potatoes?? Love these so much, especially with that sauce! These look so yummy! The perfect way to use up mashed potatoes! I’d love to include your mashed potato waffles recipe in a waffle roundup I’m doing for Parade Magazine. If you’re fine with that, could I use one of your gorgeous photos with a link back to your original post (http://159.203.224.87/mashed-potato-waffles-and-creamy-avocado-basil-sauce/)? Yes, of course, Felicia! Thanks for thinking of me! I do not have a waffle-maker; would these work as pancakes? Hi Sophie, I’ve never made them as pancakes, but they should work! Just shape them into rounds and flatten them on your pan. Let me know how it goes! This recipe didn’t come out that well in the waffle maker, it got stuck even though i brushed coconut oil on both sides. It fell apart and I had to scrape out. I was afraid it would burn if I left in in longer. It was already in for 8 minutes, not sure what happened. Thanks for the feedback, Kristina! I will retest it some time soon.